INTRODUCTION: A Revolutionary Day that tracks the 1777 British invasion from Lake Ontario. FORT ONTARIO, OSWEGO, NY: The 1777 British invasion from Lake Ontario began here at Fort Ontario. BERNHARD: The British passed by Bernhard on Oneida Lake three days after their invasion. FORT STANWIX, ROME, NY: Visit the restored Fort Stanwix where the British invasion ended after abandoning a siege on the fort and retreating back to Fort Ontario and Canada. ORISKANY BATTLEFIELD: Visit the battlefield where General Nicholas Herkimer and his militiamen, on a mission of relief for Fort Stanwix, were ambushed by British forces. UTICA: Pass by the site of the former old Fort Schuyler where the wounded General Herkimer was put on a boat on the Mohawk River for his last journey home. HERKIMER, NY: Visit the former location of Fort Dayton where General Herkimer formed-up the Tryon County Militia for their fateful march to Oriskany. FORT HERKIMER: The wounded General Herkimer stayed overnight at the Fort Herkimer Church, the central defense of Fort Herkimer. HERKIMER HOME: Visit the home where the wounded general would die while quietly reading his bible. FORT KLOCK: Visit the area where Patriot forces would stop one of the largest raids from Canada -- the Great Raid of 1780. FORT PLAIN: Visit the site of the fort that was once headquarters to all the Patriot forces in the Mohawk Valley. CANAJOHARIE: Visit the site where General James Clinton launched an attack to the southwest against the Iroquois Indians who had committed many atrocities in the New York and Pennsylvania frontiers. 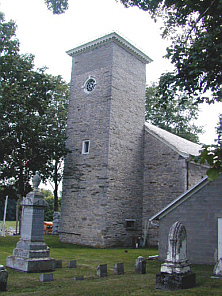 STONE ARABIA: Visit the sites of two of the oldest church congregations in the Mohawk Valley and the burial site of John Brown, the commander of the Patriot forces at the Battle of Stone Arabia. JOHNSTOWN: Visit the home of Sir William Johnson, who built an empire here in the Mohawk Valley. 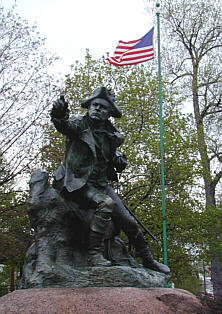 His son, Sir John Johnson, led many of the raids from Canada into the Mohawk Valley. SCHOHARIE: Visit the Old Stone Fort, which was one of the first sites attacked during the Great Raid of 1780. SCHENECTADY STOCKADE, SCHENECTADY, NY: Take a walking tour of the Schenectady Stockade and the former Port of Schenectady, head of navigation on the Mohawk River. Since September 2004, visits to this Web Page.